If you are looking for information on the Swiss Farms franchise business opportunity, Swiss Farms franchises or Swiss Farms franchising, then you have come to the right place. Since 1968 Swiss Farms has been successfully operating retail food stores based on providing a limited offering of in-demand, high-quality products, with speed of service, competitive pricing and a passion for customer service as the formula for success. Many of our customers grew up with the Swiss Farms tradition as children in Delaware County. Our customers span two to three generations who love our fresh products and reasonable prices. We make it easier for them to shop because they don't need to get out of their cars. We help our customers experience the smarter way to shop with fresher products, faster service, and friendlier help. After over 40 years of success, Swiss Farms is now franchising providing access to a great brand name, marketing and operational systems, and a proven track record. The combined buying power and support of our system allows you to focus more on your dream and not how to make it happen. We believe in our system and the results that it can produce. Starting with our help in site selection, financing options, and our best in class training program, then continuing all the way through the grand opening and operations of your store you can rest assured that you have an experienced team to help you each step of the way. 2009 was a great year for Swiss Farms, as we continue to prove our relevance to consumers. With our 2009 average store sales volume exceeding $1,600,000, up over 2007 and 2008, we have shown yet again the power of our convenient model. 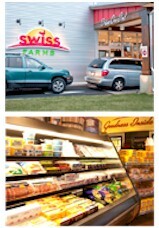 It is easy to see why Swiss Farms has been America's Drive Thru Grocer since 1968! Supermarket prices & drive-thru convenience without the supermarket hassles. 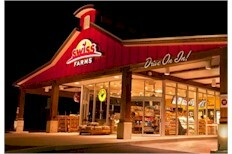 Swiss Farms is now selectively franchising for the first time in its 40+ year history. So there is plenty of available real estate - an entire frontier. This is a ground floor opportunity to shape the future - you will be an important part of Swiss Farms. But you will have the training and support of a system honed for 40 years.